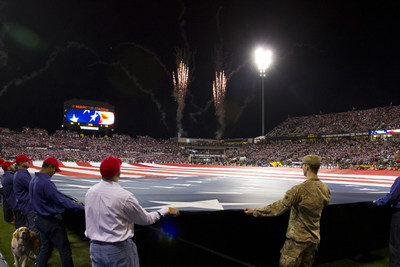 COLUMBUS, Ohio, Jan. 9, 2017 /PRNewswire-USNewswire/ -- They stood there, side-by-side: wounded veterans next to National Guard members, holding an American flag that nearly spanned the length of the field at MAPFRE Stadium in Columbus. As the national anthem ended, fireworks shot into the sky. It was a moment Marine Corps veteran Roman Sena will always cherish. "It was extremely special walking out on the field to hold the national flag," Roman said. "Everyone was screaming 'USA, USA, USA' as we walked past. The feeling I got is something impossible to put into words." "The opportunity to be a part of the flag detail with other wounded warriors and members of the Ohio National Guard was extraordinary – and it's something I will never forget," said Air Force veteran Jayson Kinsey. Wounded Warrior Project® (WWP) brought these injured veterans to be recognized and take part in opening ceremonies at the recent USA-Mexico soccer match as a way to connect the warriors to their community. Gatherings like this also connect warriors to one another so they can create support structures, which help in the recovery process. "I can talk about my time in the service and things I have done or seen without fear of judgment," said Army veteran Phillip Clumm. "Attending these events is the closest I get to the brotherhood that is such a big part of military life. It's the part that keeps us going when things get rough. It is not something that can usually be obtained in the civilian world because your life doesn't depend on the person next to you doing their job and vice versa." "I don't know where I would be if it were not for Wounded Warrior Project," Jayson said. "I've met so many great people who work for the organization, not to mention the other warriors I've met at connection events." Before the pre-game ceremony, warriors had the opportunity to spend some time with a Team USA legend, Alexi Lalas. He played on the U.S. Men's National Team from 1990-1998, becoming recognizable for his long red hair and goatee. Now he serves as a soccer analyst. "Getting a chance to meet Alexi Lalas and have him talk to us before the game was awesome," Jayson said. "He told us what an honor it was for him to put on the Team USA uniform and play a game he loved," Phillip said. "Alexi said he has been called a hero, but he feels that title is only valid when referring to the men and women who served to keep the U.S. free." The fans also encouraged the warriors. "While we were waiting for the pre-game ceremony to begin, we had fans from both teams come up to us and thank us for our service, and some of them even took pictures with us," Jayson said. "It was a very cool and humbling experience." The Men's National Team lost 2-1 on a late Mexico goal, but all of the warriors remained grateful for the experience. "Wounded Warrior Project is much more than a nonprofit. They are life-changers," Roman said. WWP sees connection events – like this soccer match, or a cooking class in Washington, D.C., or a service project in Orlando – as chances to remind warriors they are not alone. "People do not know how much Wounded Warrior Project means to some of us or how it has helped many of us," Army veteran Jeremy Davis said. "I am truly grateful for everything its staff does." To learn more about how WWP connects, serves, and empowers through programs and services that impact the lives of wounded warriors, visit http://newsroom.woundedwarriorproject.org/. To find photos from this event, click on multimedia, then images.